The Games Where It's O.K. to Be Smart! These fast-paced games help kids develop the skills that they'll need to succeed in school. Since players compete at their own age levels, BRAIN QUEST is designed for children of different ages to play together and it actually makes learning fun! 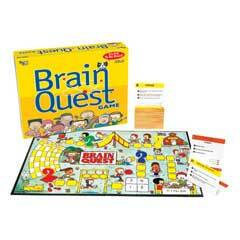 The game for grades 1 - 6 includes more than 1,500 questions on school-related subjects. Teacher's Choice Award and National Parenting Publication Award.